In 1993, the Federal Ministry of Research and Education of the Federal - public of Germany (BMBF) started the ?rst of now ?ve periods of funding mathematics for industry and services. To date, its e?orts have supported approximately 280 projects investigating complex problems in industry and services.Whereasstandardproblemscanbe solvedusing standardmathem- ical methods and software o? the shelf, complex problems arising from e.g. industrial research and developments require advanced and innovative ma- ematical approaches and methods. Therefore, the BMBF funding programme focuses on the transfer of the latest developments in mathematical research to industrial applications. This initiative has proved to be highly successful in promoting mathematical modelling, simulation and optimization in science and technology. Substantial contributions to the solution of complex problems have been made in several areas of industry and services. Results from the ?rst funding period were published in "Mathematik - Schlusseltechnologie fur die Zukunft, Verbundprojekte zwischen Universitat und Industrie" (K.-H. Ho?mann, W. Jager, T. Lohmann, H. Schunck (E- tors),Springer1996).Thesecondpublication"Mathematics-KeyTechnology for the Future, Joint Projects between Universities and Industry" (W. Jager, H.-J. Krebs (Editors), Springer 2003) covered the period 1997 to 2000. Both books were out of print shortly after publication. 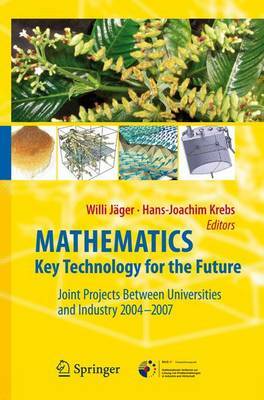 This volume presents the results from the BMBF's fourth funding period (2004to2007)andcontainsasimilarspectrumofindustrialandmathematical problems as described in the previous publications, but with one additional new topic in the funding programme: risk management in ?nance and ins- ance. Othertopicscoveredaremathematicalmodellingandnumericalsimulation inmicroelectronics,thin?lms,biochemicalreactionsandtransport,comput- aided medicine, transport, tra?c and energy.